Product prices and availability are accurate as of 2019-04-11 13:31:20 EDT and are subject to change. Any price and availability information displayed on http://www.amazon.com/ at the time of purchase will apply to the purchase of this product. For those days when nothing quenches your thirst like a big glass of iced tea, Mr. Coffee offers the ideal solution. 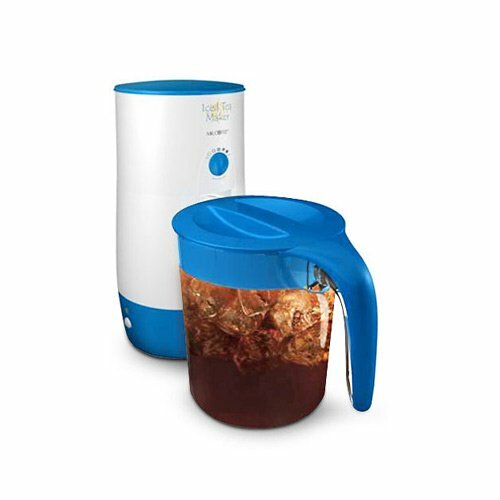 The Mr. Coffee TM39P 3 Quart Iced Tea Maker brews up a refreshing beverage in about 10 minutes. It's easy to use; just pour in the water, add tea to the basket and fill the pitcher with ice. Features an On/off indicator light and auto shut-off. 3 Quart capacity. Patented steeping chamber. Dimensions: 8-3/4"L x 8-3/4"W x 14-3/4"H. Versatile brew basket uses 2 tea bags or tea leaves. Fast brew cycle makes 3 quarts or refreshing ice tea in a matter of minutes. Steeping control lever allows you to adjust brew strength of your tea to fit your desired taste. On indicator light lets you know when the iced tea maker is on. Auto shut-off will turn off when the brewing process is completed.